The combination of a few hot days in Boston, no AC in the house, and a busy week left us looking into a pretty bare fridge tonight with little motivation to cook a big meal. We rarely eat out on weeknights and had already made one exception to that rule this week. I mustered up all the creativity I could and pulled out whatever looked good in the fridge and pantry. According to the hubby, "It was an old-standby with a refreshing addition". We have two meals that we usually end up making when we are tired and out of ideas - eggs and bagels or rice and beans. Tonight we went with the rice and beans. My new lime basil plants have been really growing, and I had a lot of leaves that needed to be used up. Digging around in the fridge uncovered a jicama I thought that lime basil and jicama sounded like an interesting combination. I pulled out my Rick Bayless cookbook for inspiration on a dressing and found a recipe for a cilantro lime vinaigrette. 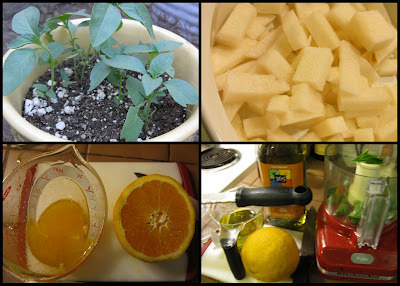 Since I had neither of those, I used what was on hand to make a lime basil orange vinaigrette. To make the salad even more exciting I threw in a handful of pepitas (roasted pumpkin seeds). This gave the salad a nice crunch and extra flavor dimension. Thanks to Oh!Nuts for sending me some tasty products to try out. For the rice and beans, I will admit that I used the microwave to cook them both. Hidden in the pantry was one of those 90 seconds rice packages and some black beans. I heated them up and then tossed the black beans with a little of the extra vinaigrette. It was delicious! The end of the week calls for a summery cocktail - my Thursday night concoction was a spiked strawberry lemonade. A cold, refreshing addition to the meal. What's your favorite go-to meal when you don't feel like cooking? Favorite pantry staples? Great post! Last night, I made my stand-by cold Kimchi noodle dish to beat the heat! Yum yum!!! Have to try.